The Shalimar Gardens Hotel in Thekkady is one of the idyllic retreat for tourists who love the beauty of nature. A unique blend of Indian and European style the Shalimar Gardens in Thekkady with its beautiful cottages is the perfect place to relax and refresh yourself after a day�s tour. Amidst the sylvan setting and the wild ambience your stay in Shalimar Gardens will be quite a memorable experience. Far away from the fast paced life of the cities spend your life in the wild natural habitat close to Periyar National Park. A wooden suspension bridge leads you to acres of greenery, thatched cottages and Ayurvedic spas whose other name is Shalimar Gardens. Shalimar Gardens surrounded by sprawling acres of greenery is the idyllic retreat for the nature lovers. The beautiful cottages in Shalimar Gardens are built in Malyalam style and reflect the rustic flavor of Kerala. The Shalimar Spice Gardens in Thekkady provide the guests well equipped cottages and the best of comfort along with health treatments through Ayurveda. Savor the multicuisine delicacies in the Shalimar Gardens which will surely pamper your taste buds. There are conference and banquet facilities in Shalimar Gardens Thekkady. 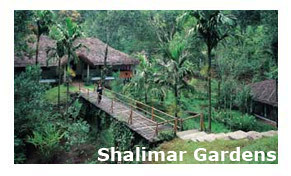 India Hotel and Resort can help you book your room at the Shalimar Gardens in Thekkady in Kerala. Find all you want to know about Hotels in Thekkady Kerala India and our customized hotel packages. India Hotel and Resort.com offers online information and booking for stay at Shalimar Gardens in Thekkady Kerala India.